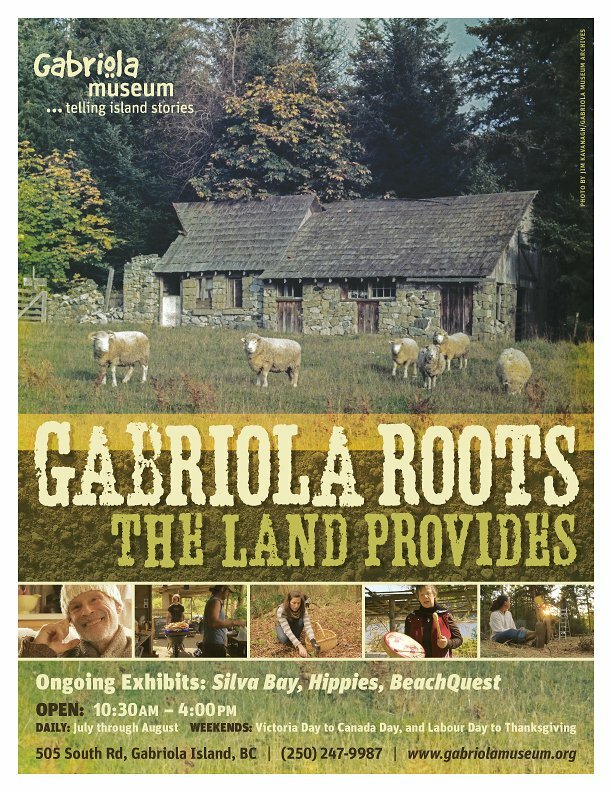 Gabriola Roots: THE LAND PROVIDES is the theme of our new season with illustrated exhibit panels exploring the multiple ways we relate to the land, from the earliest food gathering, through the farming and then land development years, to the current crop of new farmers and foragers. Filmmaker Tobi Elliott is working with the Museum’s Display Committee to create a series of short films on Gabriolans who each have a very special connection to their land, connections that affect the community as a whole. They share their experiences with communal land sharing, market gardening, medicinal plant foraging, permaculture, and a First Nations perspective. One of the new artifacts of THE LAND PROVIDES exhibit is this historic photo of the old Cooper Road barn and sheep, taken around 1970. It is believed that a Welsh stone-mason built the barn but little else is known about it. The Museum is always interested in any new information the community might be able to offer on artifacts. Sunday, May 17th at 12 noon is the opening of the Museum’s new season and our 20th year anniversary. There will be a salute to the founders, new poetry by Naomi Beth Wakan, and a celebration of the many volunteers and members that help make our new exhibits and programs possible. Come and stroll around the outdoor garden with its new informational plaques and enjoy burgers prepared by Robert’s Place. There is an audio preview of the film, THE LAND PROVIDES, streaming on the CKGI (98.7 FM) website, under “Gabriola Current” which features news of the island. Available at https://soundcloud.com/ckgi-gabriola-co-op-radio, THE LAND PROVIDES segment is from 21:00-33:00 minutes in. The Museum is also producing a future series “Gabriola Stories” on CKGI FM. You can listen to the first podcast on our Gabriola Roots page. There is also a new look for our website, to go along with our new logo, and our 20th anniversary.